Why does a company need a business recovery Plan ? Facing risks of cyber-attacks, natural disasters and other losses, companies need to be protected by an emergency recovery plan in which they can have full confidence, that is simple to set up and to activate should the need arise. A business recovery plan can be conceived either as part of a Business Continuity Plan (BCP), which covers all the services of the company, or independently, in order to guarantee, at the very least, the Continuity of information systems. Too many SMBs and mid-caps are still good enough with classic backup solutions, while crossing their fingers a major disaster will not occur or, if it does, that backups will be sufficient even if they are not tested regularly. Today, the unavailability of all or part of the applications or data corruption can have serious consequences on companies profit or even it’s continuity. Ranging from failure to respect the delivery times to the loss of customers, failure to manufacture a few pieces to the total end of production lines, establishment of false reports to legal redress. Yet a large majority of IT managers and executives consider the implementation of a disaster recovery plan as complex, costly and difficult to deploy. If it’s probably true with a classic IT backup solution, it is no longer the case with public Cloud, provided that the solution is fully automated and monitored. Why is Nuabee's DRaaS solution both economical, simple and efficient ? 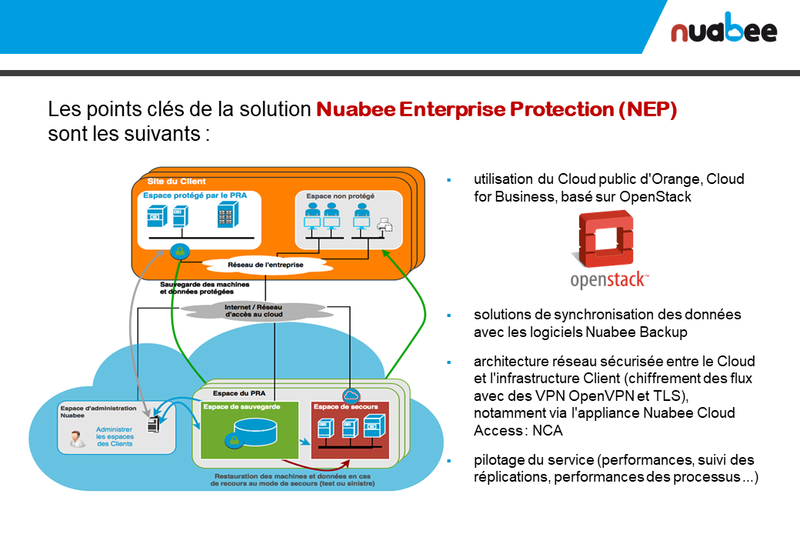 The strength of Nuabee’s solution is automating disaster recovery processes using OpenStack technology. 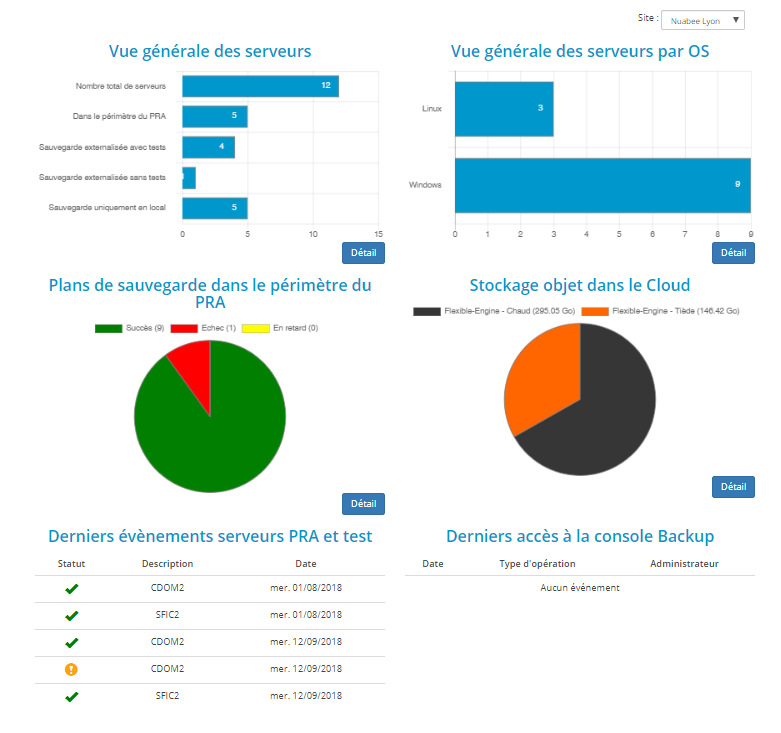 Thanks to this automation, Nuabee ensures the backup of heterogeneous computing environments (any hypervisor, physical servers, VPS, Cloud, ...) and regularly tests in a monitored way (as a Service) their restoration in the public Cloud. 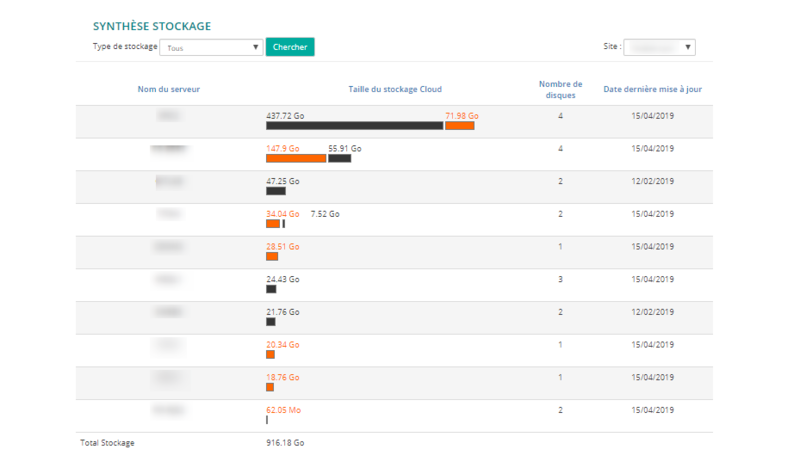 Capacity to restart critical applications in a few hours, instead of a minimum of 48h on local infrastructure. Allow regular quality tests of backups and reconnections in an industrialized and automated way and thus guarantee that, if necessary, a real activity recovery will work. Billing being limited to replicated data only (servers are only charged for when used during DRP testing or in the event of an effective activity recovery) and non-binding contract. The DraaS solution does not mobilize internal ressources of companies and allow IT executives to focus on the improvement of their work processes and the deployment of new projects. 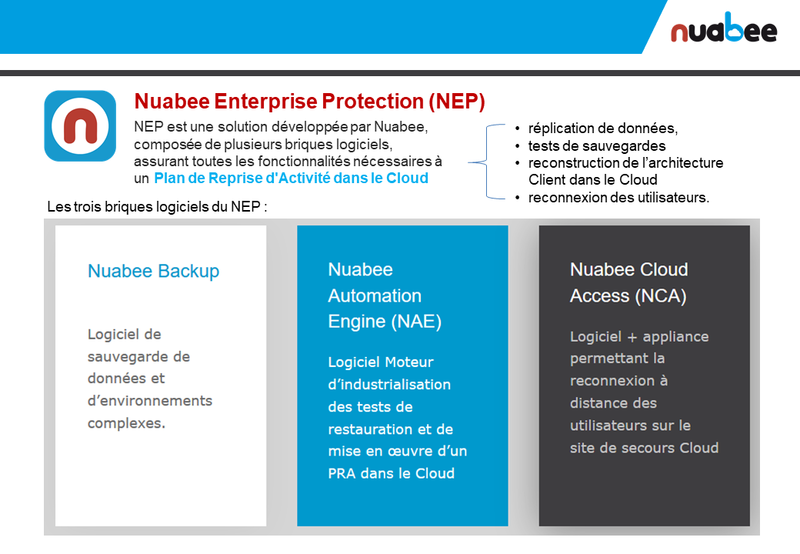 With Orange Business Services Flexible Engine, Nuabee has made the choice of a public Cloud subject to European law in order to not only allow the pooling of technical resources and a significant decrease in costs, but also to meet regulatory requirements of French companies. Nuabee strengthened its partnership with Orange Business Services since Flexible Engine was launched in 2017, allowing the company to support its customers internationally (Europe and Asia – coming soon to the United States) with a uniform and complete DRaaS solution. 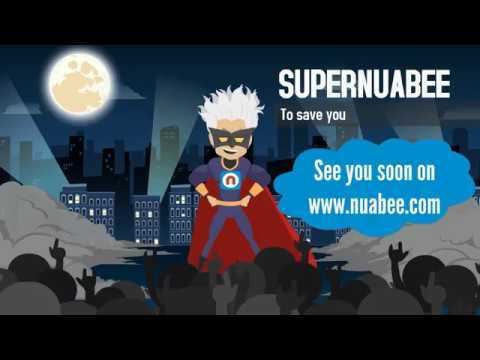 The set up of a DraaS solution with Nuabee is also an opportunity for SMEs and mid-caps to take a first step towards public Cloud, without questioning their production environment, and later, after enjoying the benefits, consider a complete migration. Differential Backup Only files that have changed since the last backup are sent back to the servers.